Facebook is not only the biggest Social networking site but the most used Chatting service at the moment with the most number of users using the chat option. 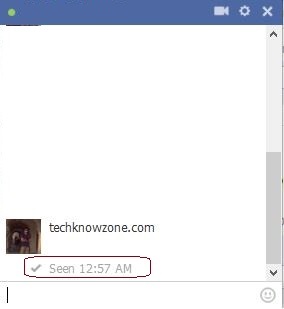 Facebook has recently introduced a new option in Chat which lets the opposite user know when you view the message by giving “Seen at – time” under the message which was sent. This is really a bad option when you are avoiding someone or don’t want to chat with them and are pretending not to have read their message but this new Seen option lets the other person know that you have read their message. So when you use this Chrome Extension the other person will never get to See the Timestamp. This is a Tutorial which works only on Google Chrome. Instal this extension in your Google Chrome Browser and enjoy privacy as your friends can’t see when you’ve “seen” their messages. Problem with this Extension: All the messages are shown as unread even after you view them until you have replied to the user.